Israeli settlements in the West Bank are illegal—but donations to the U.S. nonprofits that support them are tax-deductible. Our investigation found that one such nonprofit, the One Israel Fund, subsidizes guards who constrict the movement of Palestinians and harm their economic livelihood. The money trail to Israeli settlements begins on a main thoroughfare in the quiet New York suburb of Cedarhurst. Inside a brownish-red building next to a Judaica gift shop, up the stairs to the second floor, and behind the glass doors of Suite 210 are the offices of the One Israel Fund. The bulk of the money goes to aid Israeli settlements in the occupied West Bank. These settlements, located on Palestinian land conquered by Israel in the 1967 war, are considered by most of the world to be illegal under international law, as the Geneva Conventions prohibit settling conquered lands. Between 2001 and 2014 (the years for which records are available), the One Israel Fund raised at least $26 million from donors across the United States, making it one of the wealthiest pro-settlement nonprofits in the country. Scott Feltman, the One Israel Fund’s executive vice-president, says the organization is “strictly humanitarian.” Most of the money goes to initiatives that fortify the settlements: hospitals, religious schools, playgrounds and senior centers. But not all of the One Israel Fund’s spending fits the typical definition of “humanitarian.” According to its tax records, the organization has given at least $960,000 to security personnel in Israel and the occupied West Bank. The money has gone toward armored vests, security vehicles, guard trainings and surveillance equipment. Each settlement typically has a security director, known as a ravshatz, who is a civilian employed by the settlement but armed and specially trained by the Israeli military. (The word ravshatz—plural ravshatzim—is an acronym for the Hebrew words rakaz bitahon shotef tzahali, meaning coordinator of security with the army.) There are about 265 such security guards living in Israeli settlements in the West Bank and East Jerusalem and along Israel’s borders with the Gaza Strip and Lebanon. The ravshatzim are considered the settlements’ first line of defense against Palestinian militant attacks. But some of these guards harass and threaten Palestinians, according to human rights advocates and residents of Palestinian villages. Ravshatzim have opened fire upon and shot tear gas at Palestinians, and blocked Palestinians from working their farms. The One Israel Fund says that between December 2014 and 2016, it delivered armored vests to every security guard in the occupied West Bank. Human rights groups have documented a number of alleged abuses by ravshatzim in that time period. When In These Times showed the One Israel Fund’s public social media posts to Palestinians living near settlements, they pointed to guards receiving equipment and identified them as routine harassers. Because the One Israel Fund is a registered nonprofit, the donors who underwrite the equipment receive tax write-offs from the U.S. government. American taxpayers are effectively subsidizing settlers in the West Bank who constrict Palestinian movement and harm their economic livelihood. Ravshatzim are armed by the state and fall under the authority of the Israel Defense Forces (IDF). But they are paid by the settlement where they reside. This places them in a dual role. They are participants in an ideologically driven settlement process that displaces Palestinians, and they are under the command of a force meant to, at least on paper, prevent friction between settlers and Palestinians (though many critics of the occupation say that soldiers often see West Bank settlers as their partners in maintaining Israeli rule). While some settlement guards stick to securing their communities, others seem to spend much of their time patrolling outside the settlement. Shabtay Bendet is a former ravshatz from Yitzhar and Rechelim, and he is now a journalist for the Israeli news outlet Walla News. He tells In These Times that when he was a guard in Rechelim, he patrolled outside the settlement to “frighten” neighboring Palestinians so they would move away. Driving Palestinians off their land clears the path for settlement expansion, he explains—and expansion is a primary goal of Israel’s West Bank settlers. And by handing over equipment to guards in order to “thwart terrorist attacks,” the One Israel Fund is arguably helping to intimidate and push out Palestinians. The Israeli settlement of Yitzhar lies deep in the northern West Bank, about an hour’s drive from Jerusalem through topsy-turvy roads. Like many Israeli settlements, it sits on a hill overlooking Palestinian villages, part of what the Israeli scholar Eyal Weizman calls the “architecture of Israeli occupation,” in which settlers on hilltops can peer down and keep a close eye on Palestinian movement. About 1,300 settlers live in Yitzhar’s squat, one-story homes. Most are deep believers in the ideology of the Israeli settlement project, which since 1967 has grown to include a population of about 600,000 Jews. The settlers believe this is the Jews’ biblical homeland, and that they have a right to be here. Yitzhar is expanding: On hills below the main hilltop, mobile homes sprawl across the land. These are Israeli “outposts”—settlements built without government permission. Yitzhar, which has received at least $12,900 in security equipment from the One Israel Fund, has a particular reputation for violence and extremism. The bus stop on the way out is plastered with posters declaring “Kahane was right”—a reference to Rabbi Meir Kahane, an ultra-right Israeli politician who advocated the expulsion of Palestinians from Israel and the occupied territories. Israeli human-rights groups such as B’Tselem and Rabbis for Human Rights routinely document Yitzhar settlers descending from their hilltop into the Palestinian villages below to throw rocks at farmers and set fire to olive trees. 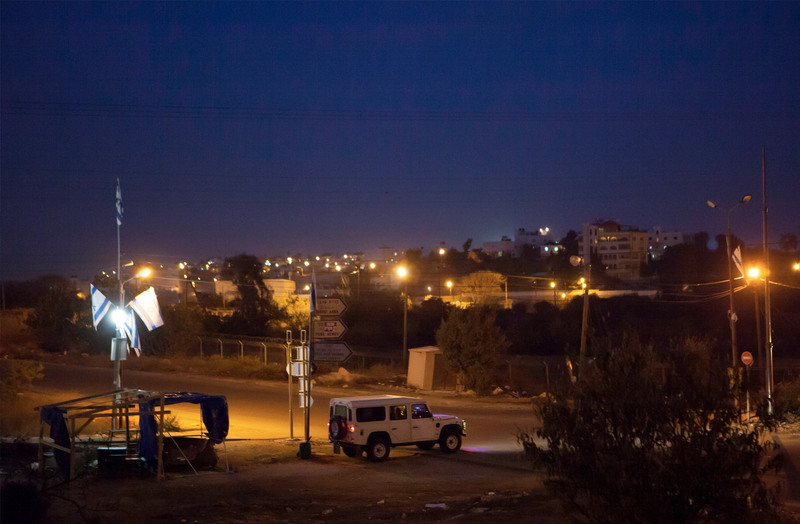 The nearby Palestinian village of Burin, visible from the road out of the settlement, is a frequent target. According to residents of Burin, their harassers include Yitzhar’s ravshatz, Yitzhak Levy. In August 2014, the human rights group Yesh Din helped file a criminal complaint against Levy for driving over plants on a plot of land owned by a Burin villager. According to Yesh Din, the police closed the case the following year, saying the offender was “unknown”—a common reason given when complaints against settlers are dismissed. Yesh Din subsequently documented three separate incidents in which Levy kicked Palestinians off their land. Twice, it says, Levy reportedly threatened to kill villagers by cocking his rifle and drawing his finger across his throat. He also threatened to bring other settlers to chop down trees in Burin—no idle threat, as settlers routinely cut down trees in the village. Several Burin residents interviewed by In These Times described the ravshatz as a singularly menacing presence. Munir Qadus, a villager, says that, according to an eyewitness he spoke with, Levy shot tear gas into a schoolyard in Burin in February 2014. Village youth responded by throwing stones. The army intervened, shooting more tear gas canisters, blanketing the schoolyard in the acrid, choking gas. Another villager, who asked not to be named because he fears retaliation, says he has had repeated run-ins with Levy over the last two years. 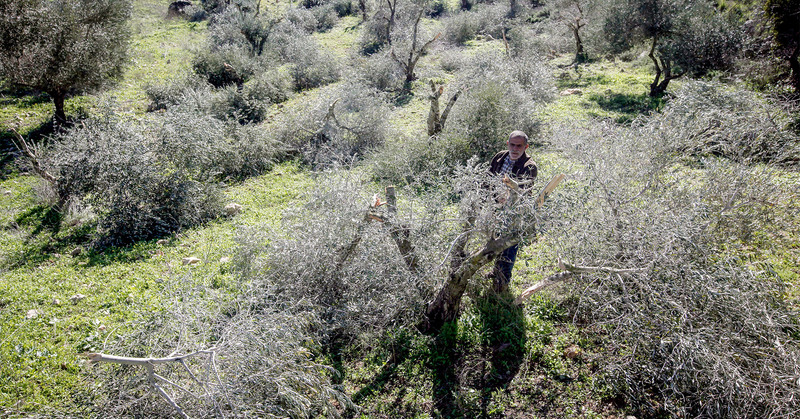 He says the guard has threatened to destroy his olive grove or shoot him if he returns to it. The farmer was too frightened to plow the land in fall 2015, leading to a diminished harvest the next year. When In These Times contacted Levy to ask about these allegations his relationship with the One Israel Fund, he was unwilling to talk. But the One Israel Fund’s Facebook page boasts of lavish donations to Yitzhar’s security operations, which its ravshatz directs. In a photo album from October 2012 titled “Itzhar - Keeping It Real,” two armed men look straight into the camera, assault rifles slung to the side, as they stand next to a thermal surveillance camera—a $10,000 tool—delivered to them by the One Israel Fund. 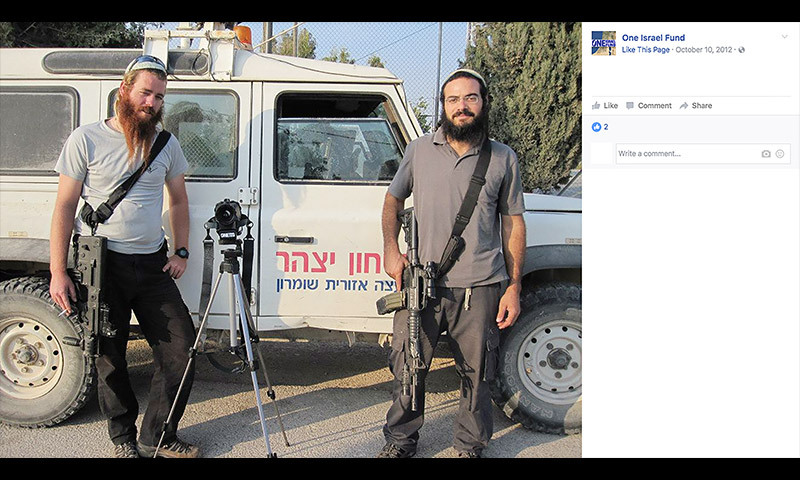 Other photos, taken in October 2015 and in February 2016, show Marc Provisor, director of the One Israel Fund’s security projects, personally giving one of these men two armored vests, which cost $1,450 apiece. An ex-ravshatz who lives in the settlement of Shilo, Provisor travels across the West Bank handing out equipment to guards. Presented with claims that Levy harassed villagers and asked about its vetting process for recipients, One Israel Fund did not respond. Three hours south of Burin is Kiryat Arba, an urban settlement of about 7,000. It is surrounded by a barbed wire fence and is close enough to the Palestinian city of Hebron that the Islamic call to prayer can be heard. The One Israel Fund has provided significant support to Kiryat Arba’s security guards, subsidizing a new security vehicle and a high-tech surveillance system to monitor the perimeter. 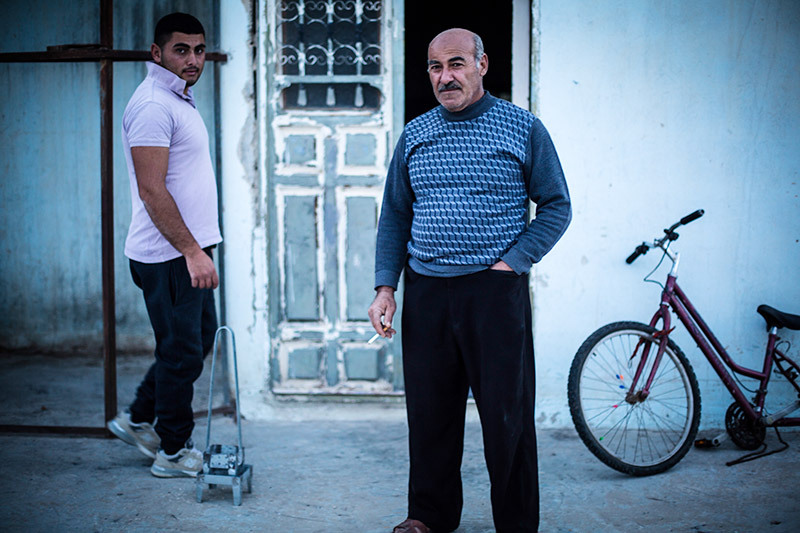 Abd al-Kareem al-Jabari, a 59-year-old Palestinian ironworker, lives sandwiched between Kiryat Arba and the neighboring settlement of Givat Ha’avot, on land that has been in his family for generations. Since building his house in 1998, he says, his family has endured repeated attacks. Israeli settlers, he says, have thrown stones at them, burned their trees, stabbed his 10-year-old son in the stomach and beaten his 11-year-old son in the face, damaging his eye. They’ve also come to his home, he says. In 2007, Jabari says, he was constructing a wall beside his house when two settler guards ran toward him and opened fire with their guns. While Jabari was not hurt by the gunshots, the incident shook his family. Twenty-five members of Jabari’s family live crowded into one house, so in spring 2016, he began building another house on his property. When bulldozers came to break ground, Jabari says, a guard drove up and parked, walked onto the property and told the bulldozer driver to stop working. He then called the branch of the local military that handles matters of zoning and construction, Jabari says. The military told the guard that Jabari had the right to build. In These Times reached out to the guard for comment but was told by a Kiryat Arba security employee that he could not answer questions. The other guard identified by Jabari did not respond to requests for comment. Getting that indictment, though, is difficult. Yesh Din has helped file 23 criminal complaints with the Israeli police against settler security guards. But the group has never secured a criminal indictment. A Yesh Din report published in 2015 found that, over the past decade, 91 percent of cases of settler violence against Palestinians or their property were closed without an indictment. The One Israel Fund is part of a network of pro-settlement charities in the United States that collectively raise millions of dollars from the most ardent supporters of Israel. The nonprofits draw from a small pool of right-wing donors, such as the bingo magnate Irving Moskowitz (who died last year) and the hedge funder Henry Swieca. Between 2009 and 2013, 50 pro-settlement groups raised over $220 million in the United States, according to an investigation by the Israeli daily Haaretz. In recent years, groups such as the American-Arab Anti-Discrimination Committee have sought to revoke pro-settlement groups’ status as 501(c)3s, which allows donations to be tax-deductible, by filing administrative complaints with the IRS. Lawyers have also filed civil lawsuits against pro-settlement groups on behalf of Palestinians. In May 2013, the law firm Melito & Adolfsen P.C. sued the One Israel Fund and other pro-settler groups, charging that they violate U.S. laws by funding terrorism against Palestinians. Their claims rested on allegations that settlers carried out Molotov cocktail attacks, stonings and beatings targeting the Palestinian plaintiffs. But so far, pro-settlement groups have prevailed. The lawsuit against the One Israel Fund was dismissed in May 2014. The judge ruled that the suit did not prove the groups knowingly fund terrorism, and that there was no relationship between the money given to settlements and terrorist acts. Nor has the IRS publicly responded to the challenges to the groups’ nonprofit status. It’s a striking fact of U.S. tax policy. 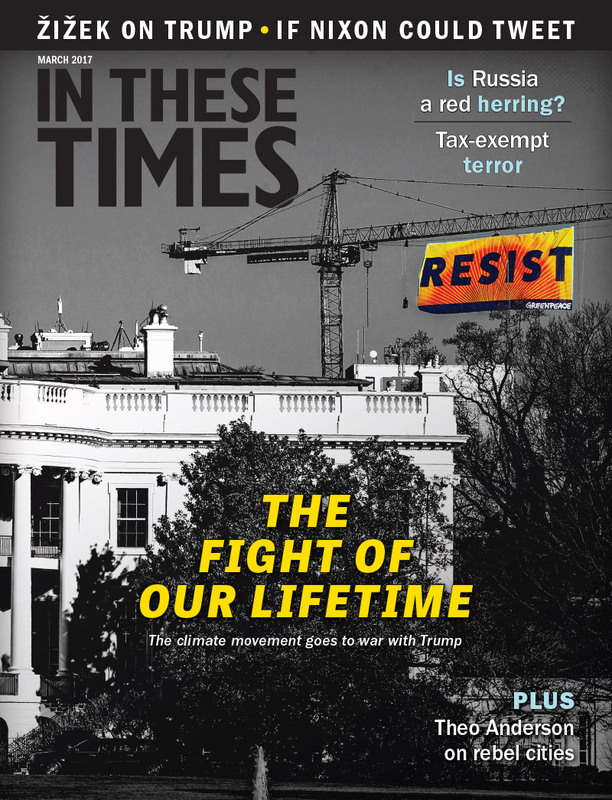 For decades, donors to settlement nonprofits have received tax breaks from the U.S. government, while presidents from both parties have spoken out against Israeli settlements. But with President Donald Trump, it’s unclear whether this contrast will remain. During his presidential campaign, Trump said that he has no problem with West Bank settlement building. In fact, in 2003, Trump donated $10,000 to American Friends of the Beit El Yeshiva Center, a group that raises money for Beit El’s ravshatz, in addition to funding schools at the settlement. Trump has selected the nonprofit’s president, David Friedman, as his ambassador to Israel. But in early February, the White House said new settlement expansion may not be helpful in achieving an Israeli-Palestinian peace deal. Meanwhile, Palestinians are left to wonder at the fact that U.S. nonprofits are funding their tormentors. Alex Kane is a New York-based freelance journalist who writes on Israel/Palestine and civil liberties.